The Latvian Academy of Sciences (LAS), founded in 1946, is a derivative public person with autonomous competence in the state administrative system, a nationwide body, which embraces all fields of learning. Its mission is to advance scientific and scholarly endeavour in Latvia. The LAS represents Latvia’s science in worldwide and European non-governmental organizations and participates in global networks of the academies of sciences. 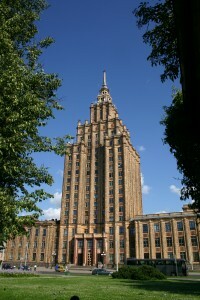 The Academy has Latvian and foreign members, as well as honorary members. Relying on the intellectual power of its members (393 members as of March 2014), elected for their eminence in research and publication, the LAS holds a variety of functions and activities: providing independent and highly professional scientific expertise and science-policy advice, promoting excellence in research, communication and dissemination of knowledge, encouraging research cooperation nationally and internationally.